How much you spend on groceries can determine how successful your budget is. When I was in college, my parents paid for all my necessary expenses – like rent, utilities and groceries. I never paid attention to how much I spent on food or how much produce I threw away. They wanted me to eat healthy and not worry about skipping fresh fruit and vegetables to save money. You can imagine how surprised I was when I graduated, got a job and started buying my own groceries. I couldn’t believe how much I was spending on food! I was living on $28,000 at the time, and trying to pay back my loans. I drove six hours round trip every weekend to visit my boyfriend and if you can remember what gas prices were like four years ago, it was closer to $4 a gallon than $2. Seriously, where were these cheap gas prices when I was spending almost an entire work day in my car every weekend? Between my loan payments ($350/month) and my gas ($200/month), my budget was tight. I cut my Hulu Plus, my alcohol budget and my trips to the mall. But those were small expenses. The biggest problem I had was my grocery budget. It’s not that I was spending a ton of money on groceries. 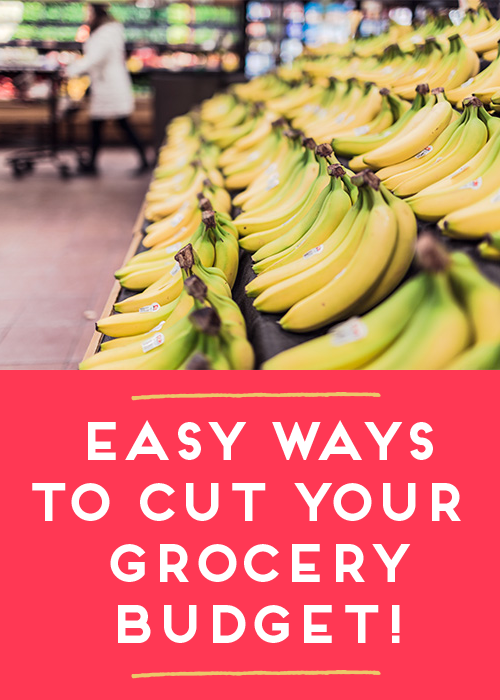 It’s that, after rent and loan payments, your groceries often make up the biggest portion of your budget. When I tell people to cut their budgets, I tell them to focus on the big line-items first. If you can cut your rent from $650 to $400, then you’ve saved $3,000. So if you can cut your grocery budget from $300 to $250, you can save $600 in one year. 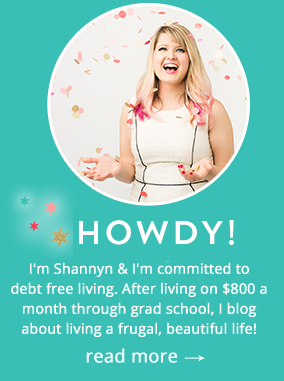 That probably doesn’t seem like much, but $50 extra toward your loans can be the difference between a 10-year repayment plan and being debt-free in 8 years. $50 can be the start of your first 401k, which after 20 years will be $26,000. One of the best things you can do is to make a list of what you already have. In college I had a habit of buying brown sugar every time I bought baking supplies. I couldn’t remember if I had it so I would buy it over and over again. At the end of senior year, I had to throw away five boxes of stale brown sugar. Make a list of everything you have in your pantry, fridge and freezer. Not only can you use it to base your meals around, but you can take it with you grocery shopping so you don’t buy an infinite amount of brown sugar. I like to divide this list intro vegetables, fruits, grains, baking ingredients, protein and meat. That way, if I have lemons, shrimp and pasta, it’s easy to see that I could make a whole meal out of those ingredients. Before you even step foot in Kroger, you need to make a meal plan. Write a list of what you’re going to eat for the week, including snacks and munchies. You need to plan out breakfast, lunch and dinner for each day. I like using this one. I’ve found that I generally only need 2-3 dinner ideas. Sometimes I’ll be lazy and have an omelette for dinner and other times I’ll go out with friends. When I remember to do a meal plan, I’m always amazed at how few groceries I actually need. If you’re like me, this is a great way to stop yourself from wasting fresh produce that you don’t have a plan for. If I wanted to save money on groceries, the hardest thing I had to learn was that I couldn’t buy everything I wanted in one place. My fiance and I have a Costco membership, where I get things like canned chicken (I refuse to buy anything besides Kirkland brand canned chicken), nuts and baking goods. I love to make cookies and Costco has the best deals on flour, sugar, chocolate chips and vanilla extract. They have some of the best prices I’ve seen on almonds and walnuts, which can be really pricey if you’re buying them in small packs from Kroger. But I don’t buy fresh produce from Costco, since I will rarely go through so much. Instead we get all our frozen fruits and vegetables there, since we’ll eat them before they go bad. I try to go to a regular grocery store for the rest of my items. I only hit up Costco every two to three weeks so I don’t feel like I’m spending an entire afternoon buying groceries. Every morning for the past six years, I’ve had oatmeal and berries for breakfast. I love oatmeal and berries. It’s a healthy breakfast, easy to make and keeps me full until lunch. It wasn’t until a couple years ago that I realized how cheap my oatmeal would be if I bought it in the bulk section. There’s a store in my neighborhood that’s like Whole Foods, except more expensive. At first I only bought my milk there (I’m a freak about good whole milk), but then I realized that their $1.49/pound price for oatmeal was the best I’d seen. I also get cous cous, quinoa and other healthy grains from their bulk section. I’ve only seen bulk sections in stores like Whole Foods, but if you find one, take a look and see what staples you could get there. Sometimes the prices don’t beat what you can find somewhere else, but often it’s a great deal. Bulk sections are great for spices, which can add up if you’re buying the $4 jars. I solely get my spices from the bulk section, since I can get as much as I need and don’t have to buy a whole jar that’ll sit in my cabinet for months until I throw it out. Every few months, I try to base my meals around what I already have. Sometimes we can forget about what we already own at home and start to base all our meals on things we don’t have. If you have a small kitchen, this is even more important to do so you don’t run out of space. There are lots of websites like Foodily where you can type in your ingredients and get recipe ideas. I usually have to buy one or two things to make the recipe work, but it’s still better than planning a meal from scratch. Making a list is absolutely the biggest! It helps so much! Definitely! The last time I went shopping without a list I spent twice as much time (and probably money). Never again. Thanks for reading! Groceries are so expensive! Great post! They are, but that’s why it’s important to use strategies to save! Thanks Jessica! Groceries are so expensive so I’m glad my post helped you find some ways to cut that down. This is all great advice! We started really focusing on our budget in January, and food expenses can really make or break a budget. We’ve got the meal planning and list making down to an art, but don’t really do too much shopping around. The majority of our groceries either come from Costco or the Smart & Final which is right on my way home from work. Depending on how far away other stores are, sometimes it’s better to save time (and gas) by sticking to one or two. I definitely prefer not shopping at a ton of stores. It takes so much time and I’d rather use my weekends for relaxing. Thanks for reading! I absolutely agree on the meal plan! When I just started doing grocery, I would buy so many random things and I realize when it’s time to make them, they don’t even match up and I ended up buying more, just so that I can actually put together a meal. I’m from Canada, not sure how wide this app covers. I just checked out Foodily. It’s awesome!!! Thank you again Shannyn! That’s awesome you have a wholesale store you can shop at without membership! It deters a lot of people here. Great post! I always struggle with staying within my grocery budget. It’s one of our highest spending categories every month.